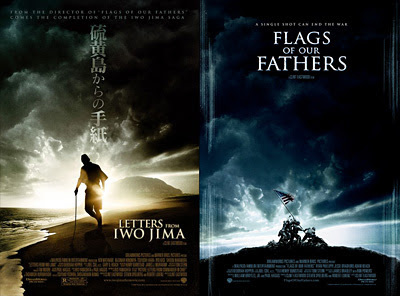 I've wanted to see both Flags of Our Fathers and Letters from Iwo Jima since when I first read that Clint Eastwood was making a war movie. Not because HE was making a war movie, or because it was a WAR movie, but because he was planning to film two sides of the same story - well more or less anyways. A concept that appealed to me a great deal. Clint Eastwood is a brilliant director, and it made the movies no worse, that he teamed up with Steven Spielberg, who did remarkably well with both Saving Private Ryan, and (producing) Band of Brothers, and it is probably no surprise that both movies carries the authenticity, mood, and sometimes rather graphical violence, that he has served before. But there's a fine line, and he walks it elegantly. The visuals are stunning, and if I have to get a little nerdy about something, then I'd have to say that I just love the color grading. I can't remember if they were shown in the danish cinemas together, or if there were the usual 3 months or half year between them, but I had already planned back then, that I would only see them when I could do so both movies back to back. I just wanted to have all the little details fresh in memory. So I picked them up on DVD last weekend, and we (that's Liv and I) watched them both, only seperated by dinner. Both films are set at the battle of the japanese, volcanic island, Iwo Jima, in 1945, where a lot of soldiers died on both sides. We started with Flags, which is the "american point of view", and rather surprisingly the main focus of the film was not the battle it self, although it does take up it's fair share. And the combat was indeed good, no argueing there. Good, believable characters too. But I found it much more to be a movie about the media circus and hypocrisy, that we know so well even in the present. Based on the iconic photograph depicting 5 marines and a navy corpsman raising the American flag on Mount Suribachi - while their comrades are still dying elsewhere - the 3 surviving soldiers of the flag raising event, are treated as rock stars as they're pushed forth, on a publicity tour set in motion by the government, to raise money for a war that has lost the public's interrest and support. Whoa! I did NOT see that coming, and for that take on the war theme, I take of my hat for Clint Eastwood. He has a thing for provocative and controversial subjects. But for some reason, I found Letters just a tad better. Not sure why exactly. Maybe because we rarely get to see this depiction of oriental culture, which is quite far from European or western culture in general. Maybe it's because we're used to seeing the typical gung-ho, american point of view, horribly heroic war movie, where "if it's not american, it's the enemy!" Maybe because it's just a little more tense on the invaded party's side. And if I thought the characters were good in Flags, then they're absolutely brilliant in Letters. Probably because of the whole japanese honour and repressed emotion thing. When an order is issued, it carries so much more weight when given by a japanese officer, than when given by an american. And if you screw up as a japanese private, you're basically fucked. The military code seems so much more strict, yet there's still room for despair, doubt, anger, regret and a whole variety of emotions that just don't fit into the situation the japanse are in, and through a series of flashbacks, we get a real good perspective of some of the key characters. Added to the fact that they're on an island, with partly damaged equipment and hardly any food or water, the suspense is thick enough to block a bayonet. Both movies really compliment eachother, and both movies can stand alone. But there's just so many little cool details, where you see one scene from the american soldiers view in Flags, and the same scene from the japanese soldiers view in Letters, like for instance the flamethrower vs. bunker scene. Small and somewhat insignificant, but nicely tied together in both movies. I only wish I could erase the experience of them, and watch them again, in reverse order. Oh well - maybe in a year or so, when I've adequately poisoned my mind with easily absorbed action, sci-fi, and animation flicks, to forget both movies. - I haven't had a look at the special edition material on either of the DVD's, so I can't really review that... Yet, anyways.